Stakeholders within the marijuana industry in California are divided over Prop 64. Is California ready to embrace recreational marijuana as envisioned by the Adult Use of Marijuana Act, aka Prop 64? Polls conducted upon the general voting public have indicated a majority of voters support Prop 64, but we’re not convinced voters within the marijuana industry in California are fully in favor of it. Marijuana Media conducted a poll between October 3-5, 2016, to determine support for (or against) California’s Prop 64 within the industry, with a total of 1,107 respondents completing the survey. The results suggested a narrow margin of victory in favor of Prop 64, representing 54.3% of decided voters. But it’s important to keep in mind this narrow margin is based on supporters of marijuana – in other words, not the general voting public, and not the anti-marijuana lobby. 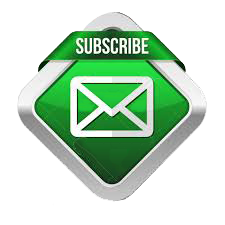 We only polled people engaged with and working within the marijuana industry. The results also did not reflect favorably on the legal changes now being developed by the state on the medical side of the industry. In fact, the poll suggested the majority of the marijuana industry is not looking forward to any type of state regulation – only 42% indicated they will be applying for licenses under the MCRSA, while 58% of respondents indicated they were either not planning to apply for licenses or remain undecided whether they will embrace licensing and regulations. Over 78% of the respondents to our poll came from California. Since the ballot measure will only be voted on by California residents, we’ve tallied results by focusing on CA-resident responses. Of the qualified CA-residents, 8.7% of respondents indicated they were “looking to start a business” in the marijuana industry. For these respondents, the vote for wider recreational access and new (medical) regulatory changes represents an opportunity to get involved in the industry. Everyone looking to start new businesses voted in favor of Prop 64, and were also interested in getting licensed under the MCRSA. 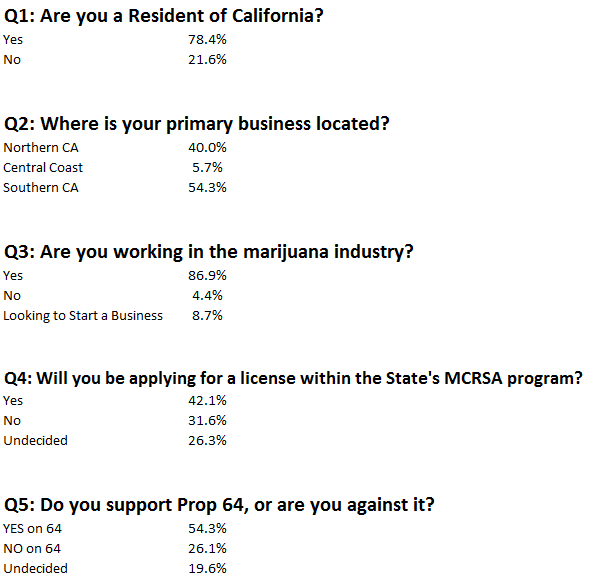 Looking at the core of CA-residents currently working within the marijuana industry, the poll did not indicate a majority of support for Prop 64: when factoring out respondents looking to start new businesses, only 45.6% of decided voters were in favor of the wider recreational access proposed by Prop 64. A large number (19.6%) remains undecided at this point. Given this divide on the merits of the ballot measure, it remains to be seen how the undecided will be swayed on election day, or if the general public will embrace Prop 64, despite lukewarm support from the very same voters who built the marijuana industry in California. FOR or AGAINST Prop 64? Your vote matters. Register and vote on November 8th.